Jon Reynolds was born in 1937 in Philadelphia, Pennsylvania. He was commissioned a 2d Lt in the U.S. Air Force through the Air Force ROTC program at Trinity College in Hartford, Connecticut, on June 12, 1959, and went on active duty beginning December 11, 1959. Lt Reynolds next completed flight training and was awarded his pilot wings at Craig AFB, Alabama, in January 1961, followed by F-100 Super Sabre Combat Crew Training before serving as an F-100 pilot with the 429th Tactical Fighter Squadron at Cannon AFB, New Mexico, from December 1961 to April 1963. During this time, Lt Reynolds deployed in support of the Cuban Missile Crisis in October 1962. His next assignment was as an L-19 Bird Dog Air Liaison Officer and Forward Air Controller with the 2nd Air Division at Tan Son Nhut AB, South Vietnam, and deployed with the South Vietnamese 22nd Infantry Division from April 1963 to January 1964. Capt Reynolds then served as an F-105 Thunderchief pilot with the 334th Tactical Fighter Squadron at Seymour-Johnson AFB, North Carolina, from February 1964 to June 1965, followed by service as an F-105 pilot with the 335th Tactical Fighter Squadron at Seymour-Johnson, and then deployed to Yokota AB, Japan, and Takhli Royal Thai AFB, Thailand, from June 1965 until he was forced to eject over North Vietnam and was taken as a Prisoner of War on November 28, 1965. After spending 2,634 days in captivity, Maj Reynolds was released during Operation Homecoming on February 12, 1973. He was briefly hospitalized to recover from his injuries at Andrews AFB, Maryland, and then received an Air Force Institute of Technology assignment to complete his master's degree in History at Duke University in Durham, North Carolina, from August 1973 to July 1975 (he was later awarded a PhD in Military History from Duke). His next assignment was as an instructor and assistant professor, Director of Area Studies, and then Director of Military Studies in the History Department at the U.S. Air Force Academy from July 1975 to May 1979, followed by service as a Political Military Officer with Air Force Plans at Headquarters U.S. Air Force in the Pentagon from June 1979 to July 1980. 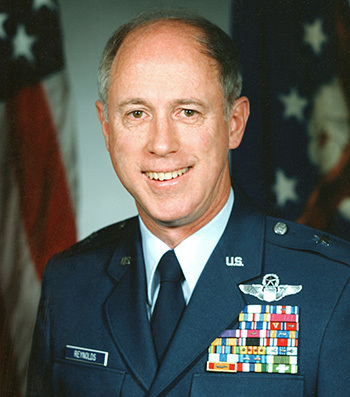 Col Reynolds served as an instructor at the National War College from July 1980 to June 1981, and then served on the staff of Headquarters U.S. Air Force again from June 1981 to March 1982, during which time he also served as a delegate to the Inter-American Defense Board. He then attended the Defense Intelligence School and studied Mandarin Chinese through the State Department's Foreign Service Institute from March 1982 to March 1984. Gen Reynolds next served as Air Attach� (1984-1986), Defense and Air Attach� (1986-1988), and as Chief U.S. Military Representative, China (1986-1988), in Beijing, China, from April 1984 to January 1988, followed by service as the Military Assistant to the Secretary of the Air Force at the Pentagon from January 1988 to August 1989. His final assignment was as Director of the Defense Attache System with the Defense Intelligence Agency from August 1989 until his retirement from the Air Force on October 1, 1990. For the Period 4 October 1967 to 13 October 1967: This officer distinguished himself by gallantry and intrepidity in action in connection with military operations against an opposing armed force during the above period while a Prisoner of War in North Vietnam. Ignoring international agreements on treatment of prisoners of war, the enemy resorted to mental and physical cruelties to obtain information, confessions, and propaganda materials. This individual resisted their demands by calling upon his deepest inner strengths in a manner which reflected his devotion to duty and great credit upon himself and the United States Air Force.